Women never get weary of learning new tricks to make the perfect ponytail because it is a hair style they wear almost every day. We visited Rodney Cutler, Redken lead hair stylist and Cutler Salon founder, and asked him to give us more information on how he styled the smooth ponytail at the recent runway show. You have to blow dry your hair in the direction you want your hair to land if you want to get an extra smooth ponytail (without bumps). If you want to ensure your ponytail lays properly you have to blow dry your hair from the root straight back in the direction of where the ponytail is going to. You should slope your head back slightly when pulling your hair into a ponytail to create a tighter hold (Cutler explained that he pulled hair back in sections). This will help to keep the hair underneath from sliding out after you fasten the ponytail. 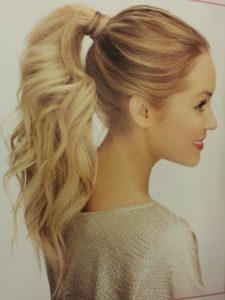 Your hair may loos tension after some time and slide out in the end if you use a regular elastic to secure your ponytail. Instead, Cutler wrapped the ponytail using a hair bungee. You should twist one end of the hair bungee clockwise around the base of your ponytail and then twist the other end of the hair bungee counter clockwise and finally tie these two ends in a strong knot to keep your hair in place.